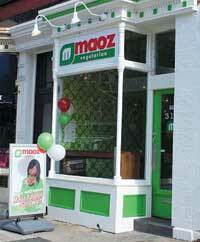 Why is Maoz different from other restaurants in Hoboken? The vegetarian falafel restaurant, which opened last week, is the first kosher restaurant in the city, and while the owners didn’t set out to open a kosher restaurant, the addition of the international franchise is a leap forward for the city’s growing Jewish community. Owned by Ray Merelas and his father-in-law Stan Picheny, Maoz is certified kosher by Rabbi Israel Mayer Steinberg, who supervises a number of restaurants around New York City. Merelas said he was introduced to the franchise by his cousin, who owns a Maoz in Boca Raton, Fla., and fell in love not only with the food but with the concept of the toppings bar. What started as one restaurant in Amsterdam in 1991 has turned into a global franchise. Maoz has locations throughout Europe and has broken into the North American market in recent years with six restaurants in New York City, as well as locations in Washington, Philadelphia, and New Brunswick. This is the first franchise for Merelas and Picheny, and they liked what they saw in Hoboken’s community. 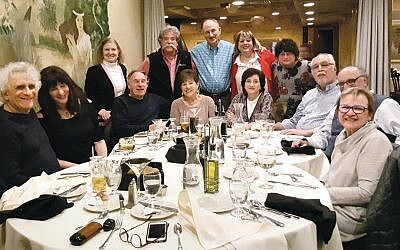 News of the restaurant has thrilled Hudson County’s Jewish leaders, who are heralding the restaurant as a sign of the community’s growth. 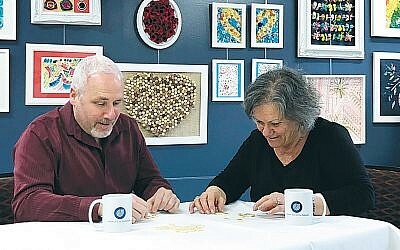 Rabbi Robert Scheinberg of the United Synagogue of Hoboken, a Conservative shul that is the city’s largest Jewish house of worship, said he and his congregants are very excited about the new restaurant and his wife has already given him a gift certificate. While he thinks restaurants like Maoz would do well in cities like Hoboken with or without kosher certification, Rabbi Shlomo Marks of Cong. Mount Sinai in Jersey City, a Modern Orthodox synagogue, said that a growing number of Hudson residents keep kosher. A few months ago, Marks began certifying Sapthagiri, a vegetarian Indian restaurant in Jersey City, after the owner saw the number of kosher vegetarian Indian restaurants in New York and wanted to expand his market reach. Marks worked with the management to make sure all the ingredients were certified by one of the major kashrut agencies and now goes to the restaurant to light the pilot lights each morning and visits for a surprise weekly inspection. There is an increased interest in vegetarianism among diners, Marks said, which he credits for the success of restaurants like Maoz and Sapthagiri. The observant community in Hudson County, also, is experiencing its own changes and growth, Marks said, which could cause some issues down the road if somebody wants to open a restaurant that would require a full-time mashgiach. For now, the rabbi is pleased with the pace of growth. And he is hopeful that a kosher bakery will open in his city.